My friend borrowed me this DS game called Plants vs. Zombies and I’ve been playing it for the last five hours. Basically, u just plant these really cute plants that shoot things or explode on the zombies. If you get into stratagy games or are easily addicted to simpleish games, you should definately go look for this game. It basically looks like this, but the setup is different on the DS. You can also play it online, HERE. I dont read directions, so I was getting pissed because I couldnt even figure out how to get past the plant chosing screen. You have to pick all eight and then click Lets Rock. Which, for some reason, just did not occur to me. Always have the sunflower– there may be another sun plant that Im not aware of… you need sun points to get more of the other plants. I always use the sunflower, the peashooter, the wall-nut (to slow stuff down), the squash (for last second defense), and the snow pea. I also like the starfruit and the hypno-mushroom. Here is a hint, which I wish Id have known to look for in the first level… But, I know for sure that when you’re on the second lvl there is a purple shooty plant that is 0 sun point things. 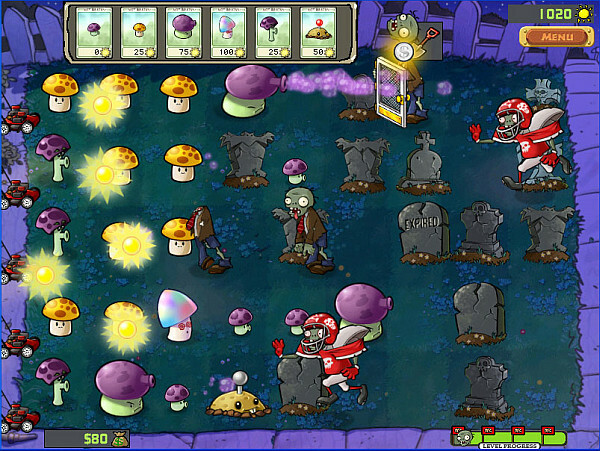 I got my brains eaten many times before I noticed that… Also, there is a mushroom plant that is white, it has dizzy eyes and makes the zombies turn around and start attacking each other. But, Ive got to get back to it now. Post if you know what the shovel is for or if you’ve played it and what your general defense set up was. So guess what people! Some of you might have heard of this already, unfortunately, I just only found out about Square Enix’s recent release of the cellphone game KH re:coded! Well…I knew about it when it was in Japan of course but naturally since I’m not in Japan I hadn’t played it and it had completely slipped my mind until today when I saw it at Best Buy and was like, “HOLYSHIT! that’s not Roxas OR Axel!” So yeah I bought it without hesitation (or shame -__-“)! Aaand right now I’m gonna tell you guys about it!